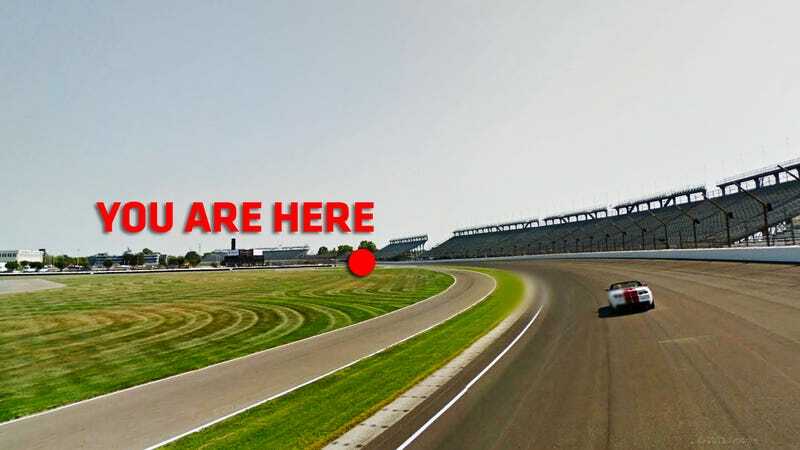 Google Maps continues its search to document every last bit of our private and public lives, now extending its all-seeing eye to the very bowl of the Indianapolis 500. Nowhere is safe, not even inside the Brickyard. Google lapped the track back in 2011, and the images are just coming out. Now that theirLat Long blog has revealed a full streetview of a track as historic as Indianapolis, other great circuits of the world should begin opening their gates to Google's click-though roadway recorders. Street View has already gone to Laguna Seca, Thunderhill, and Lotus' corporate test track in the UK. We'd certainly say that a trip to the Nürburgring is in order, and perhaps they can trade Indy's pace car Camaro for something a bit more interesting. Is Sabine busy with the 'Ring Taxi? Photo Credit: Google Streetview Thanks for the tip, Vanessa!